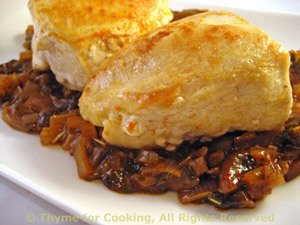 Chicken Breasts with Duxelles Sauce, quick, easy, delicious recipe. Duxelles may be more traditional with veal or beef but it works wonderfully well with chicken breasts. Duxelles: Finely chop the shallots and mushrooms. Heat the butter in a small nonstick skillet over medium heat until bubbly. Add the shallots and mushrooms and sauté, until golden brown, 6 - 8 minutes. Add the white wine and scrape up any brown bits. Cook until wine is almost completely reduced, about 1 tbs left. Add beef stock, tomato paste and herbs. Stir well, bring to a simmer. Dissolve cornstarch in wine. Stir cornstarch mixture into sauce until thickened. (You may not need all of it.) Remove from heat and cover to keep warm. Chicken: Heat olive oil in medium nonstick skillet. Add chicken breasts and sauté until golden, about 5 minutes per side. Add white wine. Cover, reduce heat and simmer for 10 minutes. slice and serve on Duxelles.